1. One main compartment, big enough to carry all kinds of essential things,such as clothes, ipad, umbrella, wallet, books and etc. 2. There is bag with shoes compartment. 3. One inner zipper pocket on back wall and slip pockets for small items. 4. Adjustable shoulder faric strap for easy and comfortable carrying. This travel duffel tote bag suitable for weekend trips or daily travel, school, gym, sports, luggage, carry-on bag, hiking and camping. Dimension: 12.40"(L) x 7.28"(W) x 12.32"(H), two-sided printing. Features: 1 main compartment, 1 zipper pocket on back, 1 interior pocket, side pocket shoes pouch, adjustable shoulder strap. Occasion: suitable for travel, trip, luggage, carry-on bag, school, gym, sports, hiking and camping. 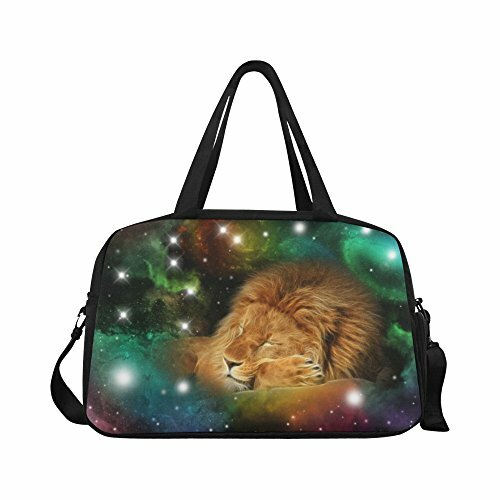 Design: custom unique pattern and durable digital printing technology, gift for her, women, men, teens.